Pratana Coffee Talk: THE SONAR IMAGE OF AMELIA EARHART'S PLANE WRECKAGE? 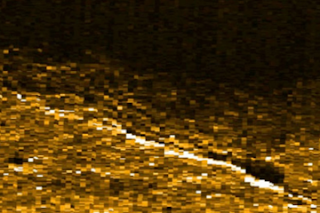 THE SONAR IMAGE OF AMELIA EARHART'S PLANE WRECKAGE? Grainy sonar images depicting a narrow, 22-ft. long object found some 600 feet below sea level in the Pacific Ocean may show the remains of the Lockheed Electra plane flown by Amelia Earhart. The world-famous aviator and her navigator, Fred Noonan, disappeared on July 2, 1937, somewhere near Nikumaroro Island in the western Pacific Ocean. Five years after successfully crossing the Atlantic on a solo flight at age 34, the airwoman was attempting to circumnavigate the globe along the equator. Image note: A sonar image released by The International Group for Historic Aircraft Recovery on May 28, 2013 displays what could be the remains of aviator Amelia Earhart's two-engine Lockheed Electra plane. First reported by Discovery News on Wednesday, the images were released by the organization best known for hunting down the truth behind Amelia Earhart’s last flight, The International Group for Historic Aircraft Recovery (TIGHAR). Although the images were taken on June 15, 2012 in the waters off Nikumaroro Island (then known as Gardner Island), it was not until the group posted them to an online forum in March that someone noticed what could be the remains of the two-engine plane, according to ABC News. TIGHAR cannot definitively confirm that the wreckage is part of Earhart’s plane, although its shape and location suggest that it may well be. Reviews of underwater footage captured last year “revealed a scattering of man-made objects on the reef slope off the west end of Nikumaroro” lying near the island, Richard Gillespie, the executive director of TIGHAR, told Discovery News. “What initially got our attention is that there is no other sonar return like it in the entire body of data collected.” He added, “it is truly an anomaly, and when you’re looking for man-made objects against a natural background, anomalies are good.” On the same trip, the search team found remnants of a possible anti-freckle cream jar popular in the early 20th century on the remote island. Earhart was known for disliking freckles. Earhart became the first woman to pilot a solo flight across the Atlantic Ocean on May 20, 1932. The trip from Harbour Grace, Newfoundland to Culmore, Northern Ireland took 14 hours and 56 minutes.